Welcome to Colden Early Years Nursery. Colden Early Years Nursery is a non-profit making charity, registered with the Charity Commission, registration number 1048790, and is a member of the Pre-School Learning Alliance (PLA), a national organisation which supports playgroups all over the country. The playgroup constitution gives the basic guidelines on how the group should be run and it also helps to maintain high standards within the group. The Nursery caters for children from the age of two years old up until school age. 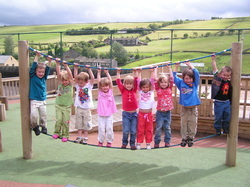 The Nursery and the Reception Class are based in the Early Years Unit at Colden School. There is integration between the settings as we share the garden, toilets and cloakroom area. We also have use of the school hall and yard for P.E. and Games and we all have lunch together in the dining room. This ensures a smooth and happy transition to school in September. Colden Early Years Nursery is a fun start to education and introduces your child to a more structured way of learning through play. Our curriculum is based on The Early Years Foundation Stage (EYFS). We deliver some of our topics through stories for example Goldilocks and the three bears and some of our topics are planned following the children's interests. There is a daily planned activity which is topic linked and the rest of the session is generally based on children's choices. We operate a key person system which ensures that each child's needs are met individually. All staff make written observations on all children and these are collated into a profile by the child's key worker. Thus each child's progress is recorded on a regular basis and this helps to inform future planning. Some Comments from Parents / Carers so far this year.
" My Grandson started nursery when he was only just two, he was very anxious about being left and cried each morning. The staff worked with me to try and help him overcome this, and he is now settled and happy. He comes home from nursery smiling and confident, keen to tell everyone about the things he has been doing. He plays nursery games with his toys at home and talks incessantly about the staff and the other children. I am particularly impressed by the way each child is recognised and treated as an individual, with time and attention given to all. The culture is respectful, calm and nurturing and personal development as well as independence are encouraged." ​"I would like to say how fantastic Colden nursery has been for my son. The staff are wonderful and have taken such care and time to help him settle in and feel happy. His confidence has grown since he has been there and he always comes home happy and full of stories of things they have been doing. He is learning within the setting due to him being there and feeling safe. I could not ask for a better nursery." "We could not be more than happy with Colden nursery. Harvey settled straight away. When it comes to Home time, he wants to stay with his teachers and friends. We are delighted with how much Harvey has progressed since starting nursery (sept 2018). His speech has come on leaps and bounds! I really like the fact that the staff communicate after each session, to inform us on what Harvey has been doing that day. Along with working with us on things we are working on at home eg potty training, no dummy, Harvey's dietary requirements." "Both of my daughters have attended Colden Early Years Nursery over the last six years. Aimee is currently registered here, and spends four days per week at the setting. The setting is run very efﬁciently and professionally, and I have every conﬁdence in the ability of the staff team to look after my children - to keep them safe, happy and well stimulated. I was made aware of my daughter’s key-worker as soon as she was registered at the setting, and I am always made welcome when I need to discuss anything. I feel that I am kept well-informed re her progress. Aimee has extra needs in the form of a metabolic disease under the care of Great Ormond Street Hospital, which requires very careful attention to the amount of protein in her diet. She also has issues with her vision/squint, and she has had seizures. With all of these issues, it can be very difﬁcult to hand over her care to someone else, but I have every conﬁdence in the staff at Colden Nursery to provide the seamless continuity required. She is kept safe at the nursery, has been enabled to take part in all activities, and her diet has always been well-managed."